KARL MAYER will surely have a flying start with an unmatched technology show at ITMA ASIA + CITME. The innovations belong to the sections of lace production, tricot machines and warp preparation units and they comprise not only new technical developments but also novel textiles and applications. Lace manufacturers will have the chance to see even two of KARL MAYER’s innovations, namely the JL 65/1B FASHION and the MT 51/1/32 offering more efficiency and flexibility. 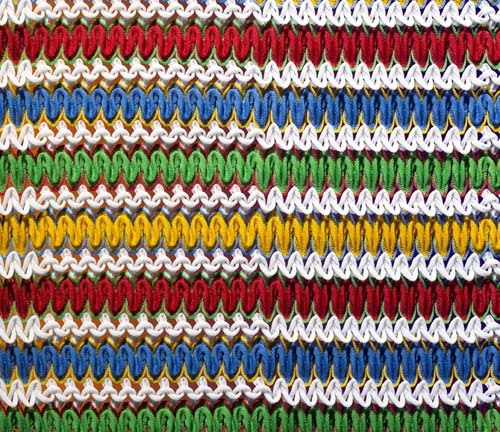 Being equipped with Jacquard bars, the MT 51/1/32 is a highly productive Textronic® Lace machine that sets entirely new standards by manufacturing lace bands and all-over lace fabrics in a wide range of different designs. The machine is offered in a working width of 134″ and it reaches rotational speeds of up to 700 min-1. During the trade fair the Multibar Textronic® Lace in E 24 will produce all-over lace articles for outerwear – and will surely be convincing, at least this is the opinion of Oliver Mathews, KARL MAYER’s Sales Director: „Since December 2013 we have been offering this new development. We have already sold a lot of these machines with delivery time in the 3rd and 4th quarters of this year. We still expect an extremely high demand for this machine which will be first presented to the trade experts during ITMA ASIA + CITME“. Concerning the Jacquardtronic® lace sector, KARL MAYER’s completely redeveloped JL 65/1B FASHION will certainly stand out when it comes to the processing of bourdon cord: This Jacquardtronic® machine beats the magic mark of 1,800 dtex when using bourdon cord, thus, manufacturing fabrics with a completely new and striking appearance. For this purpose, the JL 65/1B FASHION processes yarns with a yarn count of up to 3,250 dtex. During the exhibition in Shanghai KARL MAYER will be showing this machine in a working width of 134″ and a gauge of E 18 while producing one all-over design with bourdon cord for the fashion sector. It goes without saying that the JL 65/1B FASHION can also manufacture conventional lace bands. How to produce pattern beams in a most efficient and precise way is demonstrated by KARL MAYER’s new PBW 130/2. In Shanghai this pattern beam warper will be operating at a rotational speed of up to 400 min-1 when making pattern beams with a beam diameter of max. 140 mm and a width of 130″. Long running lengths and identical diameters make it possible to tap the full potential during the subsequent processing on lace Raschel machines. Besides, with its variable lap widths between 25 and 220 mm the PBW 130″/2 also offers extremely high flexibility. For the first time KARL MAYER’s stand will be showing a machine of the former LIBA Maschinenfabrik and today’s KARL MAYER LIBA Textilmaschinenfabrik. “So far, LIBA has never been present as exhibitor at any Asian fair. We expect to have very interesting and exciting conversations” said Arno Gärtner. A COPCENTRA 2K+E will be on display from LIBA’s portfolio. 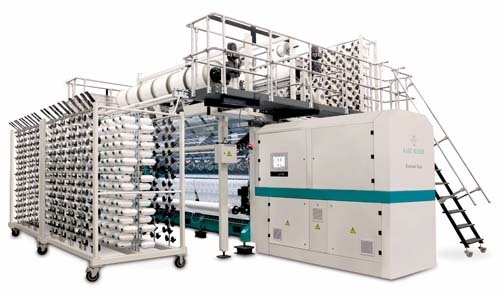 During the trade fair this high-performance tricot machine in a working width of 174″ and a gauge of E 32, equipped with two guide bars, will be producing an elastic mesh article for the apparel sector. Concerning its high-performance tricot machines KARL MAYER will be showing a new HKS 2-M model. The newcomer offers an even higher efficiency when manufacturing plain warp knitted fabrics on two-bar high-performance tricot machines. The 210″ version reaches a maximum speed of 3.000 min-1. Nevertheless, this machine was not only improved in terms of its speed but also of the costs. The excellent price-performance ratio makes the 210″ model the perfect machine to gain acceptance on the market. During ITMA ASIA + CITME a HKS 2-M in 210″ and E 28 will be producing a lightweight coating substrate. In addition to the machinery show, the visitors will also have the opportunity to learn more about the patterning possibilities offered by the EL control system on tricot machines. Main focus will be on the advantages for extended design means compared to the use of pattern disks, main applications of the EL control system and pattern design with 3D live simulations. As far as the warp preparation unit is concerned, KARL MAYER will appear at this trade fair as a competent full-range supplier for the denim technology. Out of its comprehensive product range for manufacturing jeans fabrics, the company will be showcasing a Ball Warper, a Long Chain Beamer and the yarn tensioner DiscTens. The Ball Warper is characterized by a controlled, exact and gentle joining of the yarns to ropes. The laps show an entirely parallel build-up and are of highest quality. At ITMA ASIA + CITME the Ball Warper will produce balls having a width of 1,220 mm and a diameter of 1,524 mm and operating at a maximum speed of 500 m/min. 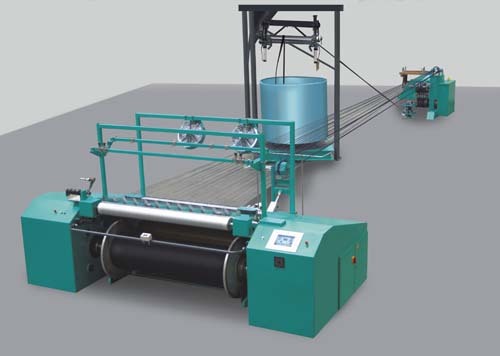 The Long Chain Beamer joins ropes to warp beams, offering perfect manufacturing quality, easy handling and highest efficiency. The technical production details of the machinery show during the trade fair: 500 m/min output, 1,800 mm beam width and 1,000 mm beam diameter. Moreover, KARL MAYER will also be presenting its dye trough Vario Double and the model of its indigo dye-sizing machine Indig-O-Matic. All these technical innovations as well as the competent experts at the exhibition stand will turn the KARL MAYER presentation at the Shanghai New International Expo Center (SNIEC), Hall E3, Stand D01, into a meeting point for the entire warp knitting trade worldwide – which, by the way, has already become the company’s traditional role during ITMA, said Oliver Mathews. KARL MAYER invites its interested customers to visit an in-house show to take place on 17, 18 and 19 June at KARL MAYER (China) Ltd. in Changzhou City, Jiangsu Province. The guests will be offered a tour of the company and the presentation of the ML series in 210″ working width. 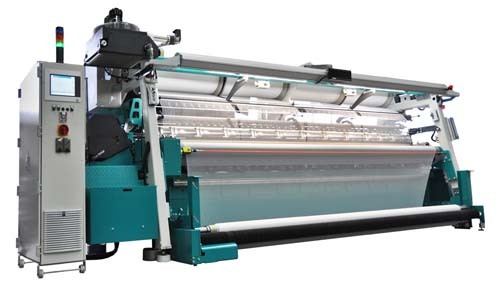 The Multibar Lace with the large working width can simultaneously produce up to four 50″ wide fabric panels, for example for making saris; thus, this machine will surely impress all those who are interested in the fashion and lingerie sections. A shuttle service will run between the trade fair and KARL MAYER (China) Ltd.